“It’ll be a cold start to the weekend early Saturday morning with temperatures in the low 30s to low 40s across the region. 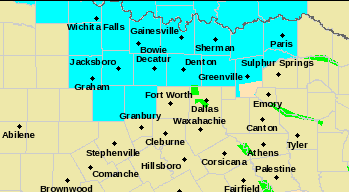 A Freeze Watch is in effect for parts of North Texas through early Saturday morning. On Saturday, highs will be in the upper 40s to low 50s. Sunday high temperatures will be slightly warmer… in the low 50s to near 60 degrees. It will be partly to mostly cloudy for much of the weekend. Rain chances will return Saturday night and Sunday for areas south of I-20 and along/east of I-35. Area in blue is in the Freeze Watch for Saturday morning.